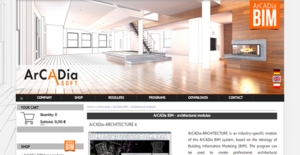 ArCADia-ARCHITECTURE 8 is a module of the ArCADia BIM system, created primarily for the professionals in the architecture and construction industry, specifically architects (but can be utilized also by civil engineers, building contractors, etc.) and is built on Building Information Modeling (BIM) principles. It provides architects and other professionals in the same industry with a software to create and manage professional architectural documentation. Architects leverage ArCADia-ARCHITECTURE 8 to create architectural designs, plans, and sections. It also offers interactive 3D previews and design visualization that are highly detailed and realistic. Top it all off, ArCADia-ARCHITECTURE 8 is loaded with advanced architectural functionalities like automatic cross-sections, automatic dimensioning or importing object shapes from other programs. ArCADia-ARCHITECTURE 8 comes with all the features and tools that are specific for professionals in the architecture industry. If you are an architect, an MEP engineer, or an installer, you will definitely appreciate how this software has all the functionalities you need to get your architecture documentation and designs done. While not really an easy software for those who are not in the architecture and construction sector, but if you are working in the architecture industry, you will find ArCADia-ARCHITECTURE 8 software highly intuitive. Integrations with the entire ArCADia suite and AutoCAD also make operations seamless. It is so easy that you don’t have to go on a steep learning curve to fully immerse and get yourself acquainted with the software. With ArCADia-Architecture, you can create any design or plan for your installation or architectural project with ease and speed as the software facilitates and simplifies the process in many activities, Whether its creating rooms or adding lintels and wreaths, you can make, add, and modify your designs without any hiccup. On top of that, you can make your designs with all the elements and attributes without having to import and export from other programs. What Problems Will ArCADia-ARCHITECTURE 8 Solve? If you are considering ArCADia-ARCHITECTURE 8 it may also be sensible to examine other subcategories of Best Architecture Software collected in our base of SaaS software reviews. There are trendy and widely used systems in each software group. But are they necessarily the best fit for your enterprise’s specific requirements? A trendy software application may have thousands of customers, but does it provide what you require? For this reason, do not blindly invest in popular systems. Read at least a few ArCADia-ARCHITECTURE 8 reviews and think about the factors that you desire in the software such as the cost, main functionality, available integrations etc. Then, shortlist a few apps that fit your needs. Check out the free trials of these apps, read online reviews, get clarifications from the vendor, and do your homework meticulously. This in-depth homework is certain to help you select the best software solution for your company’s special wants. How Much Does ArCADia-ARCHITECTURE 8 Cost? We realize that when you make a decision to buy Architecture Software it’s important not only to see how experts evaluate it in their reviews, but also to find out if the real people and companies that buy it are actually satisfied with the product. That’s why we’ve created our behavior-based Customer Satisfaction Algorithm™ that gathers customer reviews, comments and ArCADia-ARCHITECTURE 8 reviews across a wide range of social media sites. The data is then presented in an easy to digest form showing how many people had positive and negative experience with ArCADia-ARCHITECTURE 8. With that information at hand you should be equipped to make an informed buying decision that you won’t regret. What are ArCADia-ARCHITECTURE 8 pricing details? What integrations are available for ArCADia-ARCHITECTURE 8? Pros: It is easy in usages. We can see 3D output Directly. Wall,Windows and and other components placing are very easy. It takes very few minutes to render. Cons: After doing some work with ArCADia , I am facing some problems with it. These are--1. I am unable to draw any architectural element in foot/inches. There is no option of changing unit. Everything is in centimeter only. 2. Join command is not working properly. 3. There is no curtain wall component. 4. I want to place wall diagonally but it is not happening. 5. There is no handrail component for stairs. 6. Roof component is very easy but It takes too much time if I need a circular roof pattern. 7. There is no option of components and family designing. 8. External and Artificial components look too artificial, Specially trees and pools. 9. There is No walk-throw option. 10. There is no quick undo-redo option. If I want to undo 30 steps then it takes one by one. It is same for redo. It is easy in usages. We can see 3D output Directly. Wall,Windows and and other components placing are very easy. It takes very few minutes to render.